The wealth that resulted was distributed widely because of reduced migration costs and low barriers to entry. While gold mining itself was unprofitable for most diggers and mine owners, some people made large fortunes, and the merchants and transportation facilities made large profits. The resulting increase in the world's gold supply stimulated global trade and investment. Historians have written extensively about the migration, trade, colonization and environmental history associated with gold rushes. Panning for gold on the Mokelumne River in California. Within each mining rush there is typically a transition through progressively higher capital expenditures, larger organizations, and more specialized knowledge. They may also progress from high-unit value to lower unit value minerals (from gold to silver to base metals). A rush typically begins with the discovery of placer gold made by an individual. At first the gold may be washed from the sand and gravel by individual miners with little training, using a gold pan or similar simple instrument. Once it is clear that the volume of gold-bearing sediment is larger than a few cubic metres, the placer miners will build rockers or sluice boxes, with which a small group can wash gold from the sediment many times faster than using gold pans. Winning the gold in this manner requires almost no capital investment, only a simple pan or equipment that may be built on the spot, and only simple organisation. The low investment, the high value per unit weight of gold, and the ability of gold dust and gold nuggets to serve as a medium of exchange, allow placer gold rushes to occur even in remote locations. Typically the heyday of a placer gold rush would last only a few years. The free gold supply in stream beds would become depleted somewhat quickly, and the initial phase would be followed by prospecting for veins of lode gold that were the original source of the placer gold. Hard rock mining, like placer mining, may evolve from low capital investment and simple technology to progressively higher capital and technology. The surface outcrop of a gold-bearing vein may be oxidized, so that the gold occurs as native gold, and the ore needs only to be crushed and washed (free milling ore). The first miners may at first build a simple arrastra to crush their ore; later, they may build stamp mills to crush ore more quickly. As the miners dig down, they may find that the deeper part of vein contains gold locked in sulfide or telluride minerals, which will require smelting. If the ore is still sufficiently rich, it may be worth shipping to a distant smelter (direct shipping ore). Lower-grade ore may require on-site treatment to either recover the gold or to produce a concentrate sufficiently rich for transport to the smelter. As the district turns to lower-grade ore, the mining may change from underground mining to large open-pit mining. Many silver rushes followed upon gold rushes. As transportation and infrastructure improve, the focus may change progressively from gold to silver to base metals. In this way, Leadville, Colorado started as a placer gold discovery, achieved fame as a silver-mining district, then relied on lead and zinc in its later days. Butte, Montana began mining placer gold, then became a silver-mining district, then became for a time the world’s largest copper producer. Various gold rushes occurred in Australia over the second half of the 19th century. The most significant of these, although not the only ones, were the New South Wales gold rush and Victorian gold rush in 1851, and the Western Australian gold rushes of the 1890s. They were highly significant to their respective colonies' political and economic development as they brought a large number of immigrants, and promoted massive government spending on infrastructure to support the new arrivals who came looking for gold. While some found their fortune, those who did not often remained in the colonies and took advantage of extremely liberal land laws to take up farming. In New Zealand the Central Otago Gold Rush from 1861 attracted prospectors from the California Gold Rush and the Victorian Gold Rush and many moved on to the West Coast Gold Rush from 1864. The first significant gold rush in the United States was in Cabarrus County, North Carolina (east of Charlotte), in 1799 at today's Reed's Gold Mine. Thirty years later, in 1829, the Georgia Gold Rush in the southern Appalachians occurred. It was followed by the California Gold Rush of 1848–55 in the Sierra Nevada, which captured the popular imagination. 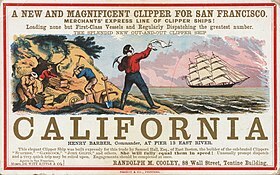 The California gold rush led directly to the settlement of California by Americans and the rapid entry of that state into the union in 1850. The gold rush in 1849 stimulated worldwide interest in prospecting for gold, and led to new rushes in Australia, South Africa, Wales and Scotland. Successive gold rushes occurred in western North America: Fraser Canyon, the Cariboo district and other parts of British Columbia, in Nevada, in the Rocky Mountains in Colorado, Idaho, Montana, eastern Oregon, and western New Mexico Territory and along the lower Colorado River. Resurrection Creek, near Hope, Alaska was the site of Alaska's first gold rush in the mid–1890s. Other notable Alaska Gold Rushes were Nome, Fairbanks, and the Fortymile River. 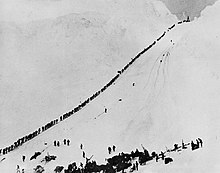 Miners and prospectors ascend the Chilkoot Trail during the Klondike Gold Rush. One of the last "great gold rushes" was the Klondike Gold Rush in Canada's Yukon Territory (1896–99). This gold rush is immortalised in the novels of Jack London, and Charlie Chaplin's film The Gold Rush. Robert William Service depicted with talent in his poetries the dramatic event of the Gold Rush, especially in the book The Trail of '98. The main goldfield was along the south flank of the Klondike River near its confluence with the Yukon River near what was to become Dawson City in Canada's Yukon Territory, but it also helped open up the relatively new US possession of Alaska to exploration and settlement, and promoted the discovery of other gold finds. In South Africa, the Witwatersrand Gold Rush in the Transvaal was important to that country's history, leading to the founding of Johannesburg and tensions between the Boers and British settlers. South African gold production went from zero in 1886 to 23% of the total world output in 1896. At the time of the South African rush, gold production benefited from the newly discovered techniques by Scottish chemists, the MacArthur-Forrest process, of using potassium cyanide to extract gold from low-grade ore.
5-gram gold coin from Tierra del Fuego issued by Julius Popper. Between 1883 and 1906 Tierra del Fuego experienced a gold rush attracting a large number of Chileans, Argentines and Europeans to the archipelago. The gold rush begun in 1884 following discovery of gold during the rescue of the French steamship Arctique near Cape Virgenes. There are about 10 to 30 million small-scale miners around the world, according to Communities and Small-Scale Mining (CASM). Approximately 100 million people are directly or indirectly dependent on small-scale mining. For example, there are 800,000 to 1.5 million artisanal miners in Democratic Republic of Congo, 350,000 to 650,000 in Sierra Leone, and 150,000 to 250,000 in Ghana, with millions more across Africa. Also known as the Golden Triangle, incorporated areas such as Ararat, Castlemaine, Marybororgh, Clunes, Bendigo, Ballarat, Darlysford, Beechworth, Eldorado. Witwatersrand Gold Rush, Transvaal, South Africa (1886); discovery of the largest deposit of gold in the world. The resulting influx of miners became one of the triggers of the Second Boer War of 1899-1902. Apuí Gold Rush, Apuí, Amazonas, Brazil (2006); approximately 500,000 miners are thought to work in the Amazon's "garimpos" (gold mines). ^ Ralph K. Andrist (2015). The Gold Rush. New Word City. p. 29. ^ Reeves, Keir; Frost, Lionel; Fahey, Charles (2010). "Integrating the Historiography of the Nineteenth-Century Gold Rushes". Australian Economic History Review. 50 (2): 111. doi:10.1111/j.1467-8446.2010.00296.x. 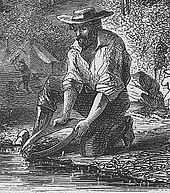 ^ a b "The North Carolina Gold Rush". Tar Heel Junior Historian 45, no. 2 (Spring 2006) copyright North Carolina Museum of History. ^ Halloran, Jim (September 2010). "Alaska's Hope-Sunrise Mining District". Prospecting and Mining Journal. 80 (1). Retrieved 28 November 2016. ^ Micheloud, François (2004). "The Crime of 1873: Gold Inflation this time". FX Micheloud Monetary History. François Micheloud: www.micheloud.com. Archived from the original on 2006-05-20. ^ "Gold rush". Encyclopædia Britannica. 2008. Retrieved 2008-08-31. ^ Malone, Michael P.; Roeder, Richard B.; Lang, William L. (1991). "Chapter 4, The Mining Frontier". Montana : a history of two centuries (Rev. ed.). Seattle, WA: University of Washington Press. pp. 64–91. ISBN 978-0-295-97129-2. Retrieved 19 December 2014. ^ The Lonely Planet guide to Southern Africa Pg85: 2010 Allan Murphy. ^ The Baile an Or project– Scotland's Gold Rush Retrieved: 2010-03-31. ^ Dollimore, Edward Stewart. – "Kumara, Westland". – Encyclopedia of New Zealand (1966). ^ Levitan, Gregory (2008). "1: History of gold exploration and mining in the CIS". Gold Deposits Of The CIS. Xlibris Corporation. p. 24. ISBN 9781462836024. Retrieved 2017-10-29. The early 1930s were marked by the decision of the Communist Party Politburo to reinstate the institution of prospectors who had been banned as antisocialist elements in the second half of the 1920s. Littlepage described in his book (1938) that by 1933 all plans to put prospectors back to work in the field had been worked out and implemented as rapidly as possible. Regulations to govern relations between prospectors and Gold Thrust were drawn up, setting in motion a Soviet gold rush. ^ Marlise Simons (1988-04-25). "In Amazon Jungle, a Gold Rush Like None Before". The New York Times. Retrieved 2008-08-31. ^ Grainger David (December 22, 2003). "The Great Mongolian Gold Rush The land of Genghis Khan has the biggest mining find in a very long time. A visit to the core of a frenzy in the middle of nowhere". CNNMoney.com. Retrieved 2011-04-24. ^ Jens Glüsing (February 9, 2007). "Gold Rush in the Rainforest: Brazilians Flock to Seek their Fortunes in the Amazon". Der Spiegel. Retrieved 2011-04-24. ^ Tom Phillips (January 11, 2007). "Brazilian goldminers flock to 'new Eldorado'". The Guardian. Retrieved 2011-04-24. ^ Lauren Keane (December 19, 2009). "Rising prices spark a new gold rush in Peruvian Amazon". The Washington Post. Retrieved 2011-04-24. ^ Chamberlain, Gethin (January 17, 2018). "The deadly African gold rush fuelled by people smugglers' promises". The Guardian. Retrieved 2019-02-27.